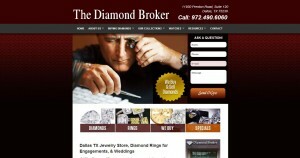 The Diamond Broker address, phone, website, hours of operation, and more. At The Diamond Broker, we stake our reputation on the brilliance of our one-of-a-kind diamonds. Since 1984, The Diamond Broker has been establishing itself as the premier diamond broker in Dallas, Texas. When you’re looking for jewelry in Dallas, The Diamond Broker is your jewelry destination. When it comes to Dallas wholesale jewelry stores, nobody beats The Diamond Broker for exquisite taste and unrivaled customer service. We have an extensive collection of loose diamonds, Rolex watches, and other fine jewelry representative of our diverse and timeless style. We’re also Dallas jewelry buyers who know quality when we see it. Visit our diamond store in North Dallas, Texas. The extensive collection of loose diamonds, Rolex watches, and other fine jewelry items at The Diamond Broker is a testament to our commitment to quality and style. The brilliance of our one-of-a-kind diamonds, combined with our commitment to the very best quality, unparalleled customer service, and timeless taste has made us the destination of all who are looking for fine jewelry in Dallas.